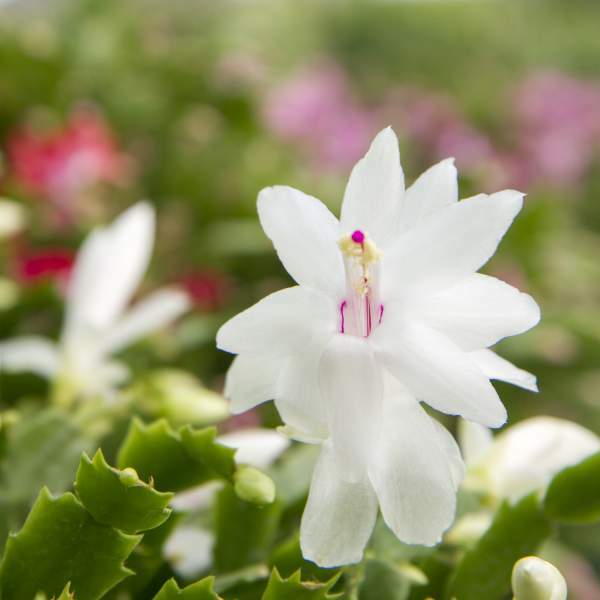 Christmas Cactus (Schlumbergera bridgesii) are native to Brazil and have become a popular fall and winter flowering houseplant. With flowers that can last 7-8 weeks, Cream make stunning hanging baskets and 4-6" pots--excellent additions to your fall and winter sales. Plant growth regulators are not recommended for Cream.Control the size of your plants by proper pinching in the summer. Cream is not prone to many diseases, but don't oversaturate the soil. If the plant sits in moist soil for an extended amount of time, you could end up with root rot or botrytis. Botrytis grey rot is usually associated with wet or humid conditions. You can prevent botrytis by allowing the plant to dry out between waterings, allowing for good airflow in your greenhouse, and spacing to allow the sun to penetrate to the soil level. The most common chemicals used to treat botrytis and root rot are Medallion and Banrot. Use them as a drench according to each label's instructions.